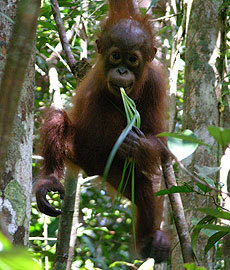 Orangutans have thickly enameled teeth well-suited to their diet. Their findings confirm what researchers have assumed, providing the first data that correlates the thick enamel of orangutans with a diet of hard foods. The results have significant implications for the study of the diet of early human ancestors, because anthropologists have long noted similarities between the teeth of hominids and orangutans, which appear to have independently evolved thickly enameled teeth that are well-adapted to the consumption of hard or gritty foods. The new study, which correlates differences in the teeth of chimpanzees and orangutans with differences in their diets, appears in the current online issue of the Journal of Human Evolution in a paper entitled, "Functional Ecology and Evolution of Hominoid Molar Enamel Thickness: Pan troglodytes schweinfurthii and Pongo pygmaeus wurmbii." "Orangutans have really thick enamel on their teeth and ridges across the basin of their molars, compared to chimpanzees, which have much thinner enamel," said Erin Vogel, associate researcher and lecturer in anthropology at UCSC. "Researchers have speculated for years about the function of this divergent morphology, but no one has ever measured the mechanical properties of their foods in the wild." In the field, Vogel and coauthor Nathaniel J. Dominy, assistant professor of anthropology at UCSC, systematically tested the foods eaten by orangutans and chimpanzees for hardness and toughness, uncovering differences that correlate with morphological differences in the two species' teeth. The study features data gathered by Vogel during nearly a year she spent observing 21 orangutans in Borneo, and chimpanzee data gathered in Uganda by Dominy. Vogel and Dominy used a new standardized engineering technology to study the properties of foods, generating data that are truly comparable across different continents, a significant advance over previous studies of monkey foods. Although orangutans and chimpanzees both prefer to eat ripe fruit, they turn to other sources of sustenance when fruit is unavailable. Those foods--called "fallback foods"--vary considerably and in ways that could explain why their teeth evolved so differently, said Vogel. "When fruit is scarce, orangutans feed on foods that are harder and tougher than what chimps eat, including tree bark and really hard seeds that would probably crack the tooth of any other primate," said Vogel. "By contrast, chimpanzees rely primarily on leaves during fallback periods, so they need those sharp blades formed by thin enamel to fracture the leaves." The findings indicate that fallback foods may have exerted selective pressure on tooth evolution, particularly on molar enamel. "For orangutans, those thick, ridged surfaces are a functional adaptation to the routine consumption of relatively tough and hard foods," said Vogel, noting also that fruit isn't consistently available in Southeast Asia, which prompts the apes to frequently supplement their diet with other foods. The findings have implications for inferring the diet of early human ancestors, and they provide valuable comparative data for researchers exploring the diets of hominids. "We know early human ancestors had thicker enamel and very robust jaws, which this study indicates could have been adaptations to eating harder, gritty foods, including the underground storage organs of plants," said Vogel. Dominy has conducted pathbreaking resarch on the diet of early humans, which likely included bulbs, corms, and other underground plant parts. The next phase of Vogel's research will be to analyze the teeth and diets of orangutans on the island of Sumatra, where the apes eat fewer seeds and bark than those on Borneo. "Orangutans in Borneo have more robust jaws than those on Sumatra, which would seem to correlate with differences in their diets," noted Vogel. In addition to Vogel and Dominy, coauthors of the paper were Janneke T. van Woerden of the University of Utrecht; Peter W. Lucas of George Washington University; Sri S. Utami Atmoko of Universitas Nasional in Jakarta; and Carl P. van Schaik of the University of Zurich. Editor's Note: Vogel may be reached at (831) 459-1757 or evogel@ucsc.edu; Dominy may be reached at (831) 459-2541 or njdominy@ucsc.edu. Contact the author at jmcnulty@ucsc.edu.